The Return of the King movie is the final film in the epic Lord of the Ringstrilogy released by New Line Cinemas under the direction of Peter Jackson. Like the other two films in the trilogy, The Return of the King movie follows the general storyline of the JRR Tolkien book, though at least one major section of the book, “The Scouring of the Shire”, was edited out of the films. The film was released on December 17th, 2003. Following the precedent left by the previous two films, a Special Extended Edition was released on December 14th, 2004. The Return of the King takes up the narrative thread where it was left at the end of the second movie, The Two Towers. Some of the action that appears in the first part of The Return of the Kingactually takes place in the book version of The Two Towers, but Jackson had made the conscious decision to add it to the final movie. Like the previous two movies in the sequence, The Return of the King was released in December 2003 to rave reviews. From a monetary and awards standpoint, it was also more successful. The Return of the King movie grossed $1.1 billion worldwide and currently stands as the second highest-grossing film of all time, behind only 1997’s Titanic. The movie was also nominated for 11 Academy Awards, and tied a record by sweeping all 11, including Best Picture. The movie also won the 2004 Hugo Award for “Best Dramatic Presentation”. One very controversial topic tied to the film was the deletion of “The Scouring of the Shire”, a scene which Tolkien himself considered to be essential to the story. “The Scouring of the Shire” in itself is a slightly anti-climactic scene, when the hobbits return home to The Shire after the War of the Ring to find all that they knew changed. The idyllic beauty that was The Shire is disappearing, replaced by an almost “totalitarian” rule and soiled with the smoke of industry. This scene is very important to Tolkien’s developed themes of change and the sad truths of industrialization. In the interest of time constraints and flow, Jackson cut the scene from the narrative. This proved to be very controversial, but obviously did not damage most viewers’ overall perception of the movie. As with the previous two movies, Howard Shore conducted and composed the musical score, which was rewarded with a Best Music (Original Score) by the Academy Awards. 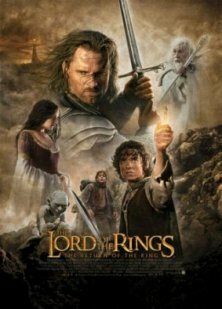 Check out our great selection of Tolkien and Lord of the Rings movie posters.